Once upon a time, a very long time ago, there was a beginning, an epoch, a start to a period of time which was distinguished apart from all that went before. It was a time of innovation and invention and one of the inventions was, as you need no prompt, the humble beginnings of the Scalextric home racing revolution. Born from the furtive imagination of Fred Francis, it was soon to become a recognised hobby and source of social interaction for young and old alike. Clubs sprang from social events at peoples homes and to fuel the ever increasing demands of those addicted, the Lines brothers expanded the appeal of their product with new models, new track features and new accessories. As hobbies go it was a boom time for Scalextric. The ability to bring head to head, fast action competition to the general public in their lounge rooms was also a new concept. Father and son played it together, class mates played it together and a whole cross section of society played it together. It had grabbed the imagination of several generations and through thick and thin it was to endure. When all else was faltering, Scalextric and its many imitators were to endure. At times when some manufacturers felt the good times were over it still endured and even when the brand itself was under scrutiny from its several successive owners it still managed to endure. In the years to follow, some offshoots of the famous brand were reinventing the hobby on mainland Europe. The Spanish slot car buying public hadn’t given up on its appeal, in Germany the public were indulging in their excesses with their own manufacturers. And at sources dotted around the world were dedicated groups of hobbyist who made sure that every good toy and hobby store had a bit of what they fancied on the shelves. It wasn’t until the mid nineties though that the quality of the product actually started to see some changes. Until now there had been a retrograde decline in product quality with models becoming more and more basic, obviously a measure to keep the cost of a lesser hobby within the bounds of profitability. Bodies were one piece mouldings and a minimal amount of parts were clipped into these shells to represent the latest motor racing technology of the day! The nineties saw Ninco come onto the scene and it was obvious that things weren’t quite going to be the same again! Cars that drove well out of the box with no vices and no continual breakdowns, Easy to maintain and a range of essential spares off the shelf! One by one there has been a succession of manufacturers joining the market. Some decidedly dodgy and some positively brilliant. Diecast manufacturers too joined the fray and even some of the classic static kit makers rejoined the hunt. I suspect buy the end of the nineties alarm bells were ringing in the ears of two of Europe’s traditionally largest manufacturers. About this time, Scalextric and Carrera had taken stock of the new competition and slowly but ever slowly, they turned their respective leviathans around and headed off after the Spanish upstarts. To me, 2007 marks the end of an epoch – and the start of a new one! With people like Fly and Slot.it and Revell/Monogram and AUTOart producing superbly detailed models and these and more producing models that run really well for some time now you may well ask what delineates this year as a new era! 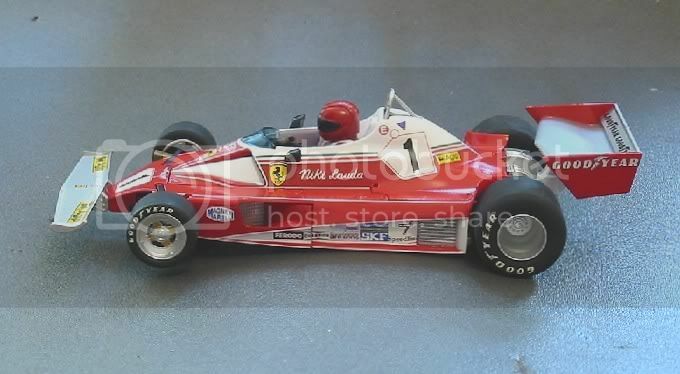 To me it is the first time that the detail quality of a much more expensive diecast model and the performance of a frontline slotcar have been brought together in the same model. Not only are these new Scalextric models absolutely stunning in detail, which I will mention later, they encompass the performance which people have strived for in a slotcar for many years. Some might say this movement was started by the MG Vanquish Company of Spain’s Lotus and Brabham a few years back but with them there was always controversy about scale and poor quality (diffs). The cars too were just too delicate to race, even on a home track with no fences. Vanquish’s demise is an epitaph to their false start to the new epoch. 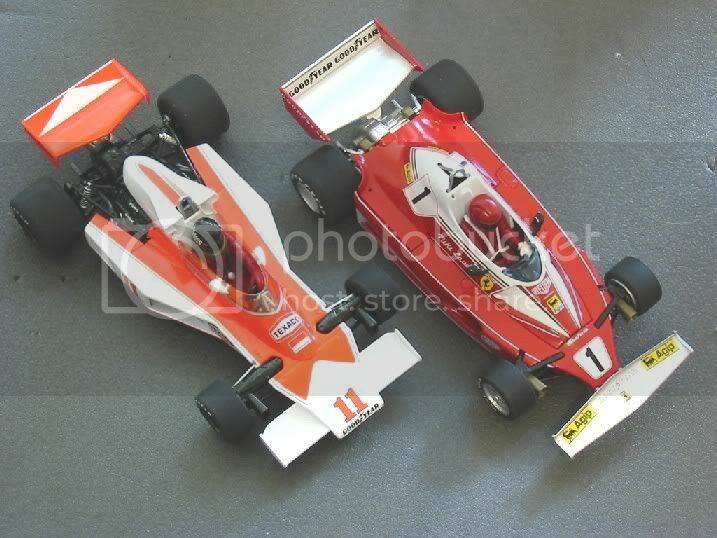 The Hunt / Lauda Classic GP set is a milestone. Even other presentation sets from other leading manufacturers do not measure up. For me, you can keep your Le Mans sets and your Sebring sets and all the rest! The Classic GP models are....are.....are??........................ EXQUISITE!!!! So how do we follow that? Well, we don’t really so I’ll just have to tell you why they are exquisite, with all their faults!!! Firstly, I obtained my pair from the perennially reliable ‘Scalexworld’ in Adelaide. Not only do you get service with a smile, but they are probably the best value too! So after a Saturday morning phone call the models were on their way, registered post (taking no chances with these beauties) to my humble abode. As always it is a case of sitting down with the new arrival over dinner and perusing its initial impact with a nice cup of tea! These were no different. Opening the box I was greeted by two breathtaking models. I’m sure my heart stopped beating for a bit! For all intents and purposes, these could have been the real thing, shrunk to a Gulliver size. 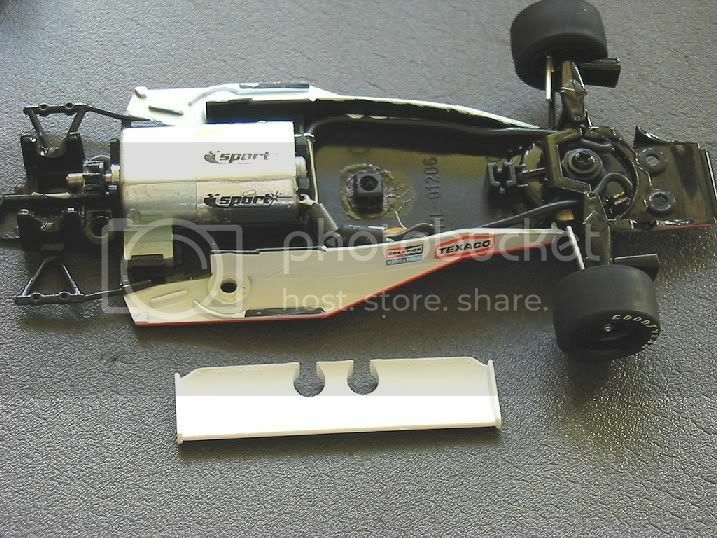 The detail for a slotcar is amazing! Absolutely! So where do we start. Scalextric have missed hardly a trick on these cars, The tampo is spectacular and the sheer wealth of realism too is awesome. Both models come with independently rotating front wheels set on their own stub axles, much like some Fly cars. The pins are fixed into the front suspension quite ingeniously and fairly sturdily too. But the front suspension is vulnerable. The Ferrari suspension is made from a type of nylon material and has a lot of flex. This is stiffened up by the fact that it rests in recesses in the body shell. The McLaren has the bottom suspension parts fixed to the chassis and the top, as delicate as it is, is heat welded via some tiny pins to this. Both models rest on their guides at the front so the suspension is more vestigial if anything. On a home or short circuit it will be reasonably resilient but on a good sized club circuit you must be prepared for tears before bedtime! Home board track racers too shouldn’t have a problem either. The front wings are also ‘out there!’ again, fairly robust but likely to be a statistic very quickly on the average club track. Both model’s front wings are readily detachable so it must be assumed these models will have them as a spare part fairly soon. The rear wings are probably less vulnerable but all the same, they are ‘out there’ too. I shall never forget the carnage of a Scaley Indy car race on a large Ninco track. 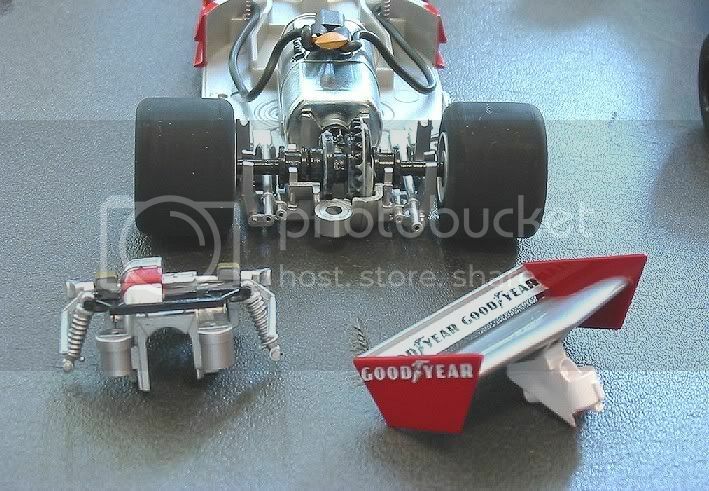 Front wings were ripped off in multiple deslots and the rears soon followed in the ensuing pile up of models. These are replaceable too, being fixed by a single screw. Better still, remove them before racing! On a lot of models, mirrors fall into the short life span category, but in this case I’m sure there will be plenty of McLaren’s and Ferraris on eBay in twenty years time complete with driving mirrors! The McLaren’s are fixed through the screen and can be easily detached having only the smallest spot of adhesive on them. The Ferrari comes with the new style ‘flexi mirrors as already seen on the JGTC’s. The only other parts which look immediately vulnerable are the tops of the roll cages. Probably safe in a one car deslot but a potential loss during a pile up. The final exterior detail of note is the rear suspension and engine detail. Scalextric have reproduced this to the N’th degree and as it sits well surrounded in the rear of the model it may well be assured of reasonable longevity! The McLaren shows the Ford Cosworth in all its glory and to top it is a nice pair of exhausts running either side of the diff. The diff housing itself is from Brothers Grimm. 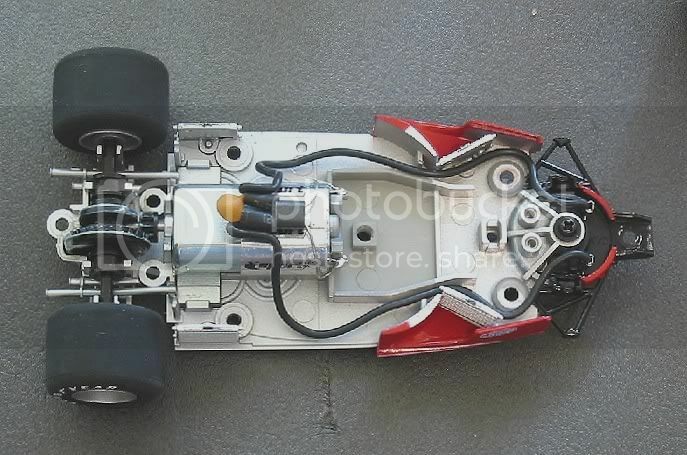 The business end of the slot car is too large to incorporate into a scale transaxle but Scalextric have done a marvellous job disguising it in a mock casting complete with reinforced webbing. Wheels and tyres, which are my weakness, are gorgeous. Well and truly gone are the days of banging on a set of standard wheels to appease the masses, with every model looking much the same as the next. The wheels look brilliant and what’s more the rubber on them doesn’t feel too bad either. Time will tell if it lives up to expectations. Track testing is one thing I am and am not looking forward too!!?? Lastly for the outside, there are some nice repros of the cooling system heat exchangers on both sides and large scoops to the front brakes. 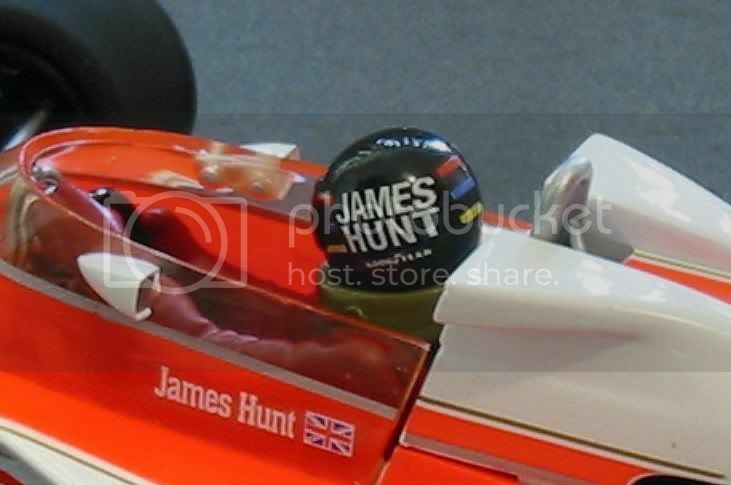 The James Hunt figure comes complete with neck brace and both models have their respective heads ‘posed’ rather than the all too familiar straight ahead stare of yesteryear. For those who want to upgrade the motor already (surely not!) it will be required not only to get the model apart, but then to get it back together again. Be warned, not a job for the feint hearted! There’s no forcing bits together here!! The McLaren has seven body screws and the Ferrari has eight! All screws need to be removed when doing it for the first time, parts interlock and overlap and trying to do it piecemeal may well see something break. The McLaren has two screws under the front wing and a pair either side of the motor, these can come out first, then remove the three screws that hold the diff housing. 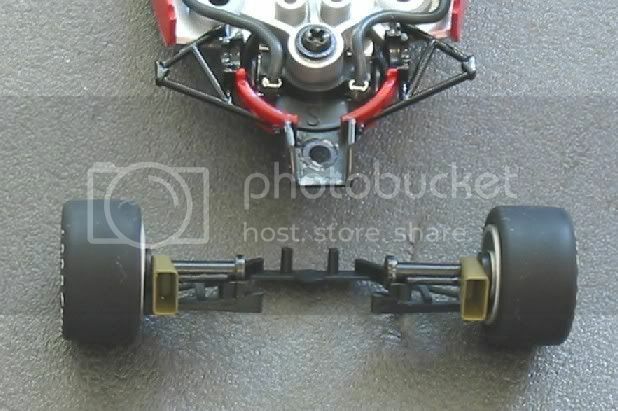 The main body will come off now and the front wing and suspension will detach readily from the chassis. 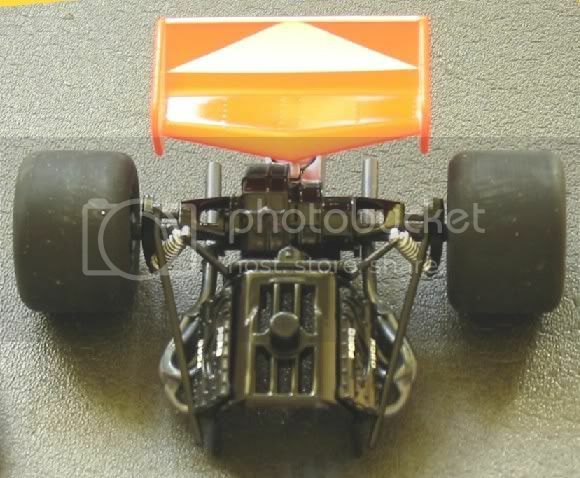 The rear axle not only clips into the chassis but also clips into the engine/transaxle detail. The axle will need to be removed with the engine detail and finally unclipped from that. At this time the rear wing can be detached too. The Ferrari is a little simpler. The front wing and body fixing is a single screw, there are four main screws holding the shell to the chassis and finally, three screws holding the rear wing and diff cover on. Once apart, it can be seen how little room there is for anything additional. In the Ferrari you even have to get the lead wires in the exact spot beside the motor to get the shell on. Be careful not to bend down the RI capacitor here. If you have, the body WON’T go on no matter what! The Mabuchi ‘F’ can sits snug and tightly in both models. No problems here, and the front axles rest in a couple of pin holes for reassembly. 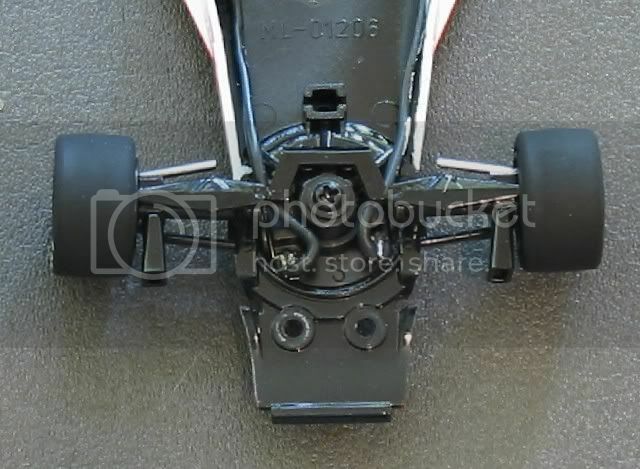 The McLaren front axle is not readily detachable. Some people may think the RI precautions are excessive but they are a legal requirement in a lot of countries and interference of other peoples TV reception is illegal. The guide is the same as usual and it relies on lead wire tension to centre it, so if you do take the body apart, make sure the lead wires to the guide go back in neatly or you will create a marshall’s nightmare. These models come with the delicacy in detail of the now defunct Vanquish marque but with a bit more robustness for the home user. My models may well have a couple of exploratory outings in controlled circumstances (i.e. Not on the local club tracks) and I will content myself with waiting for the releases later this year of the single models before entering one in a race. Not only that, with the Fly March bearing down on us I might well indulge myself with that one for competition too. Lastly, the traction magnets have been well thought out. These models will cling onto Carrera track quite readily and even withstand a careful inversion and on Scalextric Sport track and at 65 grams a model, they are as stuck down as much as you could want without impeding their forward motion. On the track they are both very quick. The 65 mass of each model impedes the cars progress very little. I tried both mine out on Classic Scaley track and the only observation would be that hard acceleration over the Grand Bridge caused both models to lift out on the crest. The track would need to be a little flatter in fly over sections to prevent this. 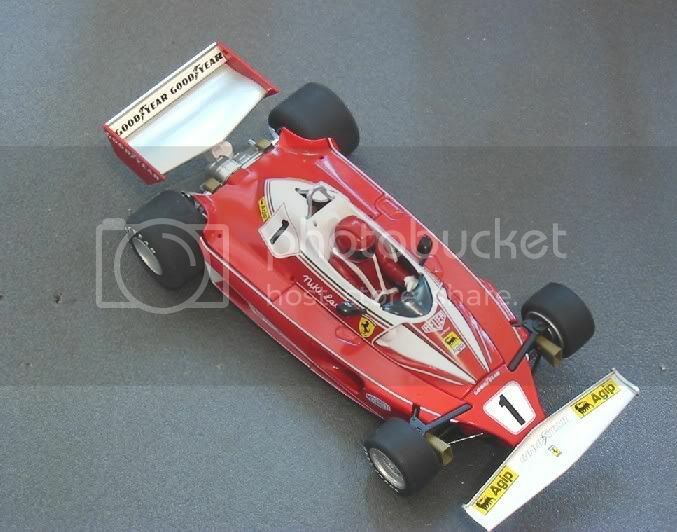 The models are very sure footed and compare admirably to the modern F1’s in handling. You can put the boot down at the apex of nearly any bend and the models will smartly hurtle round them and set of for the next obstacle. So not only do these look good, they fly too. Which one is faster?? Hard to say as they are both well matched. I got the impression that the McLaren was a little quicker but that maybe because it was a little noisier for whatever reason. Tyre adhesion is spot on and front end stability is good. Again, another pair of racers which would be hard to pass by! I have run both of mine SOOB and they will probably go straight back in it before there is damage incurred. 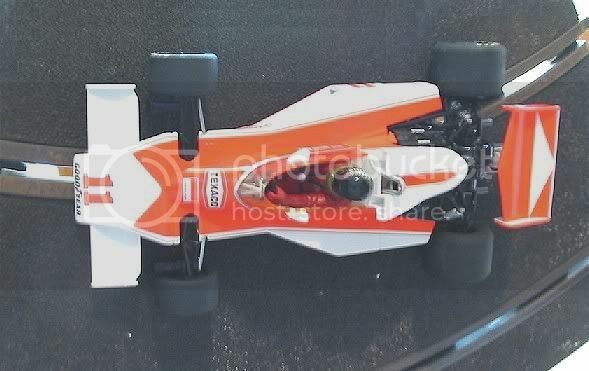 I have the MRRC McLaren with ‘S’ can for a track car and I will probably wait for the Villeneuve / Regazzoni models to use as track cars. Once again, a couple of great models which will race into the sunset, niggles? A couple. Firstly it would have been nice for the tampo to have full content but I do understand why it isn’t so. The other is the unbelievably fiddley location of the motor wires at the motor. My Ferrari stopped during testing and was shorting the track. It turned out to be the bare motor wires touching the metal foil of the motor wrapper and shorting out. Once sorted, this took another half hour just to get the body back on!! So, a great pair for the shelf and we can only brace ourselves for the models to follow!! Bring it on!!!!! !